Location is perfect. It is in the El Poblado neighborhood and it is close to nightlife, restaurants, parks, and the metro. The rooms were really nice and the bed was comfortable. Staff spoke English and were very helpful when I asked for information. The open atrium was really nice. The sound of rain was very peaceful. Finally, the daily breakfasts were fantastic with fresh fruit and juices, it was a great way to start a day of sight-seeing and walking around Medellin. 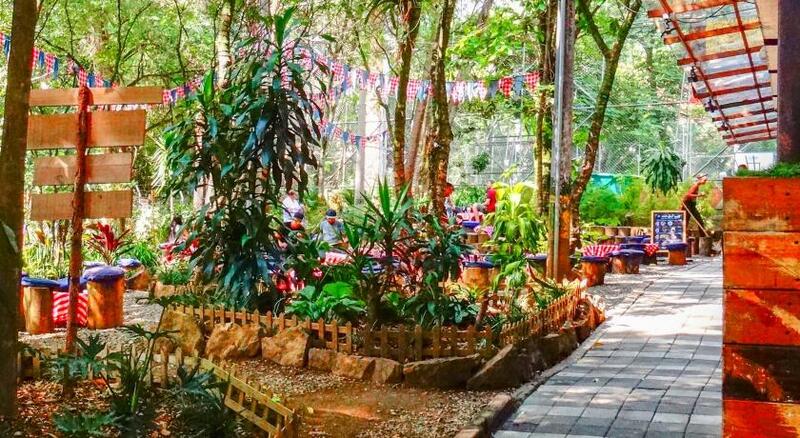 Location is very good, so you can spend your whole day outside in some nice restaurants parks or bars instead of spening time in this Hell Hotel. Just stayed here one night. Selected for location and not wanting a standard all white-colombian hotel room. Cool hotel with exposed-brick, great rooftop bar, staff was nice. Breakfast was fine. Location excellent. 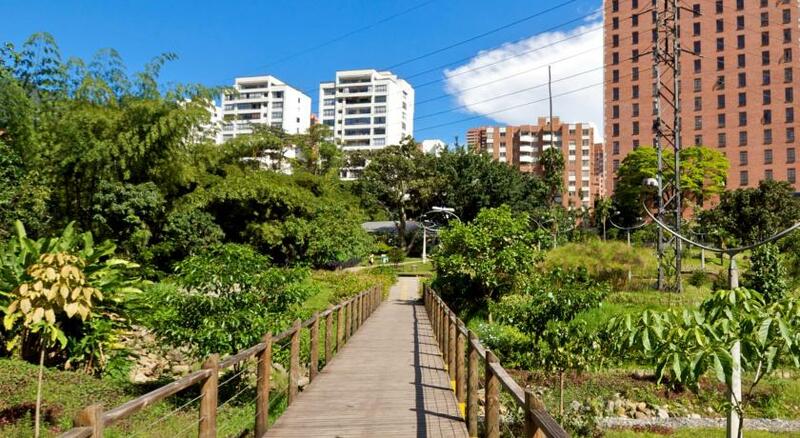 Great location in El Poblado on the edge of the nightlife district for Poblado! Great breakfast options each day included with room. Fantastic, very helpful staff, great location, nice rooftop bar / restaurant with city views. The location is good, although it is quite loud by night if your room is facing the main street. The breakfast was excellent and the stuff in the restaurant as well. The location was amazing and their roof top bar even more! I loved the property and would stay there again. Art Hotel Boutique Medellín This rating is a reflection of how the property compares to the industry standard when it comes to price, facilities and services available. It's based on a self-evaluation by the property. Use this rating to help choose your stay! One of our top picks in Medellín.Art Hotel is a boutique hotel located in Medellin's El Poblado neighborhood, featuring exposed brick and modern art. It is 1,650 feet from El Poblado Metro Station and 1.2 mi from Medellin Convention Center. Rooms and suites at Art Hotel are stylish, with designer lighting and chaise lounges. All rooms have TVs with a DVD player. Some rooms have extra living space and luxurious bathrooms. There is free WiFi throughout. Art Hotel has a wine bar, as well as an art gallery and movie theater. The hotel is 650 feet from Lleras Park, where there are many restaurants and bars. El Poblado is a great choice for travelers interested in nightlife, food and local food. When would you like to stay at Art Hotel Boutique Medellín? Larger room with a sitting area. Features air conditioning, plasma TV, DVD player, minibar and private bathroom. Hotel surroundings – This neighborhood is a great choice for travelers interested in nightlife, food and local food – Check location Great location - show map Guests loved walking around the neighborhood! House Rules Art Hotel Boutique Medellín takes special requests – add in the next step! Any additional older children or adults are charged COP 119000 per night for extra beds. Other Art Hotel Boutique Medellín accepts these cards and reserves the right to temporarily hold an amount prior to arrival. Art Hotel Boutique Medellín accepts these cards and reserves the right to temporarily hold an amount prior to arrival. Please note that extra beds are offered upon request. You can use the Special Requests box when booking, or contact the property directly with the contact details provided in your confirmation. Tried to call ahead and to request early check in as our flight arrived early in the morning. On arrival, room wasn’t ready so left our bags at reception and spent the day getting to know Medellín. Came back at 2pm as the receptionist said we may be able to get in before 3pm - unfortunately this was not the case, they were quite inflexible and it was quite clear that after such a long flight and a day out all we needed was a shower and our own space. Walls were wafer thin, you could hear everything on the street and even heard early morning alarms going off in the next room. We went upstairs to have a drink at the bar around 6pm, no one was up there to serve which was a shame. Overall we did enjoy our stay but there are a few simple things that would have made this a top experience. Good location, rooms were spacious and clean. Breakfast staff were lovely. The room and especially the bathroom could be cleaner. The breakfast options were a bit limited. The location was great you can walk to many cool restaurants and the main going out area (parque Lleras) is 3min away. The design of the hotel was beautiful, the room was very nice and modern. The rooftop is amazing, one of the best ones in Medellin. Sometimes theres no hot shower. And the breakfast was very standerd. The hotel staff are not friendly, the hotel smells of damp and is just overall dirty. Had many issues with the tv, air con etc. The bed felt dirty as many prostitutues had spent the night away in the room, sheets were itchy and the whole room smelt of dampness. The hotel and room looks funky and nice for 5 mins then reality sinks in. My room was on the fifth floor with the restaurant bar area on the sixth. A few times it was a little loud due to diners and dishes being moved around. There is no shuttle service to the airport, but the front desk will arrange a private car back to the airport. It is easier to catch a taxi at the street corner. Came back to this location because it had really pleased my previously but was put in a room without an outside window with partly open blinders to the hallway leaving privacy questionable. Also, the intermediate wall between me and the next room was so thin, that I could literally hear my neighbor breathe. This caused a very uncomfortable situation. I have been in noisy rooms before but never experienced anything quite like this. There wasn't a thing I couldn't hear. Sometimes it seemed they were in my room. As in my previous review from another visit, the finishing and workmanship in the rooms is somewhat lacking. Sockets hanging out of the wall. Paint chipping off. Unacceptable for a hotel in this class. As in my previous review from another visit, the breakfast selection was still good. Friendly and Helpful Staff. Perfect location. Finishing and workmanship in the rooms is somewhat lacking. Sockets hanging out of the wall. Paint chipping off. Unacceptable for a hotel in this class. Good breakfast selection. Friendly and Helpful Staff. Perfect location. The ceiling leaked heavily on to the bed while I was sleeping. To the point where the mattress was soaking wet. I was not provided any kind of concession and was told that I did not qualify for one as the heavy leak was “clean” water. They never confirmed what caused the leak. There was no parking at the property. Bar was not open in Sunday night. But an excellent resto bar less than a half block away: Alhambique. The actual room furniture and finishings were more rundown/worn than I expected and our "view" was of a wall. That was fine for one night, what sucked is we were on the 5th floor directly below the breakfast area and from 6:30AM-10:30AM, all you heard was the squeak/scrape of the metal chairs on cement. It was brutal, even with the AC and our phones/background noise. I wish we would have been in a different room. If that was different, it would have been higher rated, decent value for money. Noise levels are especially high if you overlook the street. Shower could do with a bit more power. Breakfast staff although very friendly mixed up my orders on 2 occasions. I would still return on my next visit. Great staff on reception especially Freddy always very friendly and helpful. Affordable hotel and close to the bars and restaurants. Bed was comfortable and room was spacious. Room was too noisy. Amenities were sub standard. Breakfast was fine---service was great.